A Komodo dragon in the Komodo National Park in Indonesia. Common name: Komodo dragon, land crocodile. Komodo dragons are native to the archipelago of Indonesia to the islands of Komodo, Flores, Rinca, Padar and Gili Motang. Adult Komodo dragons are terrestrial and have a wide habitat that includes tropical savannah forests, wide open areas with tall grasses, beaches, ridgetops and dry riverbeds. Their home range covers about 0.77 sq miles or 2 sq km. Their territory overlap as they do not defend it. Young Komodo dragons are arboreal until they are 8 months old when they are too heavy to climb then they become terrestrial for the rest of their lifes. Komodo dragon map distribution. Source: Komodo Dragon Facts and Information. The Komodo dragon is the largest living lizard species. They dominate the ecosystem where they live because of their size. These animals are ecotherms meaning that they heat their bodies absorbing energy from the sun and cool themselves under shade or burrowing. In adults the color of the dorso is solid brown or grayish brown. The belly is grey with faint speckles. Juveniles are green with yellow and black bands. Males are larger and heavier than females. They have a curved, forked yellow tongue. Its entire body is covered with rough scales. They are round and larger in the head. These lizards have strong limbs and tail that allows them to jump and move fast. Its tail is as long as its body and they use it as a weapon to hunt. The Komodo dragon has two glands in the lower jaw that secrets venom. The effect of deep wounds and the toxicity of its venom include anticoagulation and shock induction. The tip of its tongue detects scent using the Jacobson’s organ rather than its nose. They can recognize airborne scents as far as 2.5 miles or 4 km aided by winds. The average length of an adult male is 8.5 feet or 2.59 meters. Its weigh ranges from 174 to 201 lbs or 79 to 91 kg. The average weigh of a female is 150 to 161 lbs or 68 to 73 kg. Komodo dragons are opportunistic carnivores eating invertebrates, birds, mammals and smaller Komodo dragons. They also eat carrion. They would ambush any prey that seems suitable. They eat by tearing pieces of flesh and swallowing it whole. Smaller preys are swallowed whole. After it digests, the Komodo dragon regurgitates rests of bones, hair and other indigested parts of its prey. Then it cleans its face on the ground or on bushes. Young animals eat insects, eggs, geckos and small mammals. Komodo dragons are most active during the day. They are solitary animals but they get together to eat and to mate. They build shelters by digging holes of up to 10 feet or 3 meters. In these shelters they rest during the hottest part of the day. They spend their day looking for prey and basking in the sun. There is a social hierarchy, larger animals will eat first. They show dominance by using body language and hisses. They even resort to wresting. Young Komodo dragons live in trees to hide away from predators until they are 8 months old and become terrestrial. They hunt their prey by delivering a bite which leaves it unable to escape due to loss of blood or shock from its venom. They have been known to attack humans and livestock. On average male Komodo dragons reach reproductive age at 10 years old while females at 9. Males engage in a mating combat ritual with females. These animals mate between May and August and lay their eggs around September. Females dig a nest in the ground and cover her eggs with the excavated material and leaves. She lies next to the nest to protect her eggs. They lay a clutch of 1 to 20 eggs. Incubation lasts 7 to 8 months and eggs hatch in April. Hatchings are 14.6 in or 37 cm long and are independent after birth. There are two reported cases of parthenogenesis from female Komodo dragons in Chester Zoo in England and Sedgwick County Zoo in Kansas. Parthenogenesis is the development of embryos without fertilization also known as asexual reproduction. It is not encouraged since it may be detrimental to genetic diversity. They live up to 50 years in the wild. 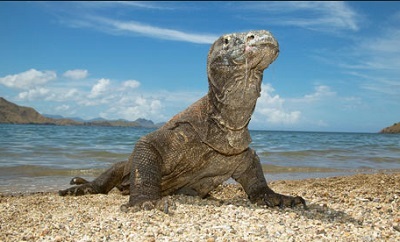 The Komodo dragon is protected under Indonesia law. 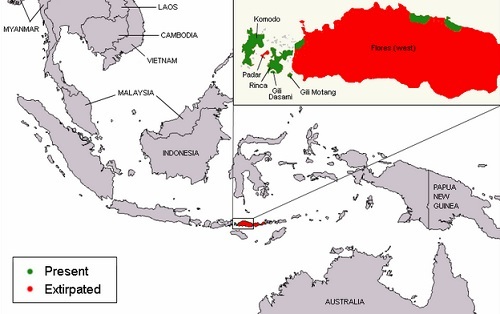 The Komodo National Park was created to protect the animal. Scientists estimate that there are 4,000 to 5,000 Komodo dragons in the wild. The IUCN lists the Komodo dragon as a “vulneralble” species in its Red List of Threatened Species.